Use knife to cut out large rib in collard greens – compost. Stack leaves and roll up then cut into ¼ inch strips. Cook bacon in a large pot over medium heat until crisp. Remove with slotted spoon to a paper towel lived plate. Add onion to bacon fat and cook over medium heat stirring occasionally until softened. 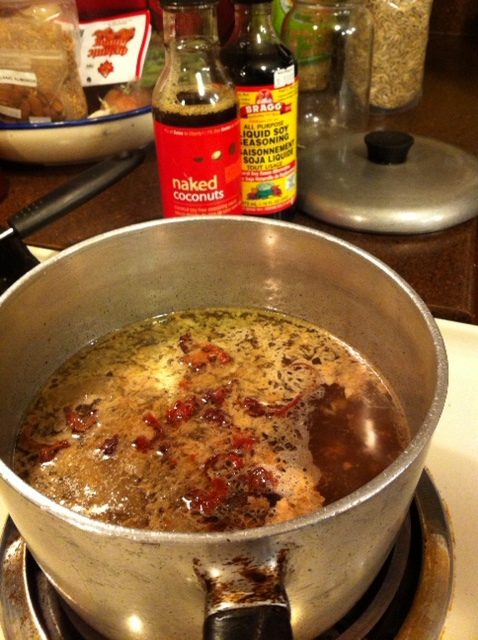 Add broth, vinegar, sugar/honey, red pepper flakes and tabasco to pot and stir to combine. Add collard/mixed greens and turn or mix them occasionally. Cover turn heat to low and cook for an hour, stirring occasionally. 6. Before serving, sprinkle bacon on top and season to taste with salt and pepper. Asian soup with loads of veg. It’s amazing how much cabbage you can thinly slice and pop into a soup. Take your leftover turkey or chicken bones from Christmas. Put in a pot, cover with water by 3 inches, let simmer for about 12 hours. Remove the bones and voila, you have the base for a soup. and about 3 tbsp sriracha hot sauce. Bring soup to a boil then add in about 4 cups finely shredded cabbage, 3 cups sliced mushrooms, 1 cup shredded carrot, 2-3 cups chopped fresh kale. If your kale is frozen add it in at the end with the green onion instead. Let simmer 3 minutes until cooked, then add in 1 bunch chopped green onion, some chopped basil, and 1 bunch chopped cilantro (if you like cilantro). Cook up some rice or egg noodles or long life noodles. Place in the bottom of a bowl and add in the soup. Voila! Dinner. 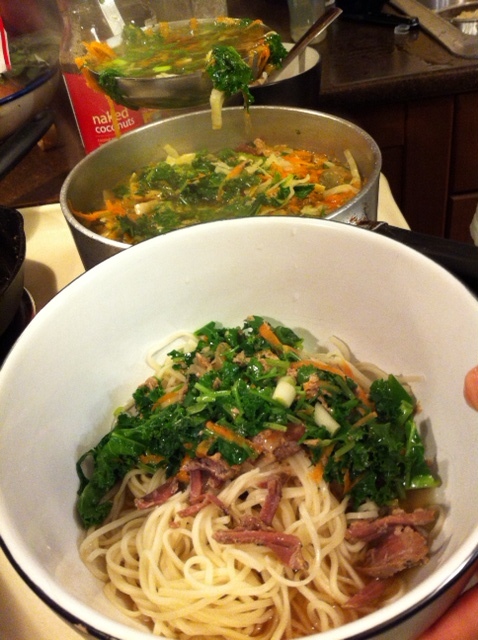 In my soup I added in some left over roast pork. Left over roast beef or chicken works well in this soup as well. A short video of Erin demonstrating the techniques of kale washing!! A generous customer named Jennifer has suggested this wonderful smoothie to use up your kale! Give it all a good zip in the blender – I feel like Popeye every morning when I drink this! I chop, bag & freeze a bunch of apples and kale at once so it’s ready for me. What’s this you say? A salad dressing made out of…..more salad? Well, kind of. This is the dressing that we have been using on the kale salad that we sell at the store. And it’s our wonderful customer Christina who forwarded this recipe over to us. Until Christina sent this over, I had no idea that zucchini in a food processor turns into a wonderful paste. With the addition of the oil, miso and lemon, the paste turns the consistency of a thick Caesar dressing. All of the satisfying texture and taste of a bad for you dressing….but with raw veggies and no chemicals! Here it is, courtesy of one healthy foodie to the rest of us! If you liked the Kale and Quinoa salad, you’ll love this warm kale and beet salad. 2 Beets peeled and sliced thinly on a mandolin. Alternatively, one beet and one yam peeled and sliced. 1/4 cup each of slivered almonds, shelled pumpkin seeds and sunflower seeds. Toasted over medium heat until browned but not scorched. Heat 2 tbsp oil in a heavy pan, sautee sliced beets/yams until soft and some are a little bit caramelized. 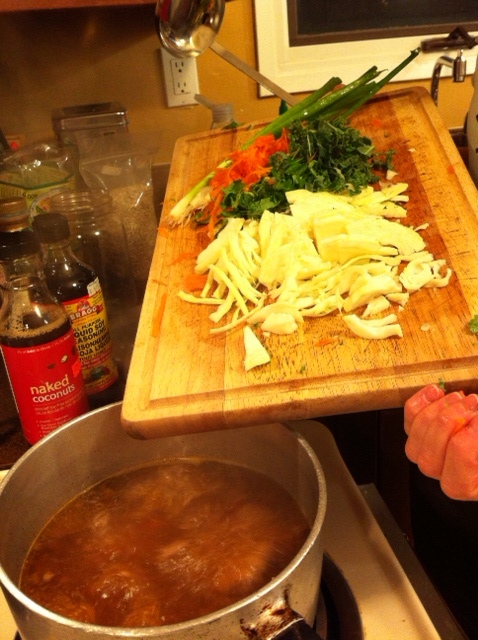 Toss the still hot sliced veg into the kale. Stir until mixed in and the kale is slightly wilted. Sometimes I sprinkle flaked Dulse (a variety of seaweed) on top, sometimes I add in a few raisins or cranberries. I just make sure not to add any veggies that have a high water content like cucumber or tomato which makes everything soggy.